A radical new plan of action for corporate managers from the co-author of In Search of Excellence and A Passion for Excellence. In this adaptation of his bold new book, Tom Peters delivers an urgent message: if American corporations are going to thrive in today's (and tomorrow's) turbulent economic/political world, a revolution in both management practices and organizational structure is required. The winning companies will be those (and only those) that are able to adapt quickly to rapidly changing customer needs and market conditions, creating new market niches and continually adding new value to every product and service. 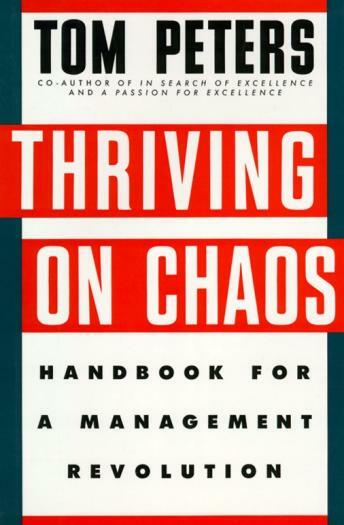 Combining trenchant analysis with a series of 45 prescriptions encompassing literally hundreds of concrete actions and examples, Thriving on Chaos shows what managers at every level must do -- and do now! -- if this revolution is to be accomplished. An essential tool for corporate survival.